Edged and crooked. With the GT60, MSI throws a 15,6-inch notebook with current Ivy-Bridge-Processors on the market. The notebook is aimed to score with a fancy design, as well as with other gaming-related features. 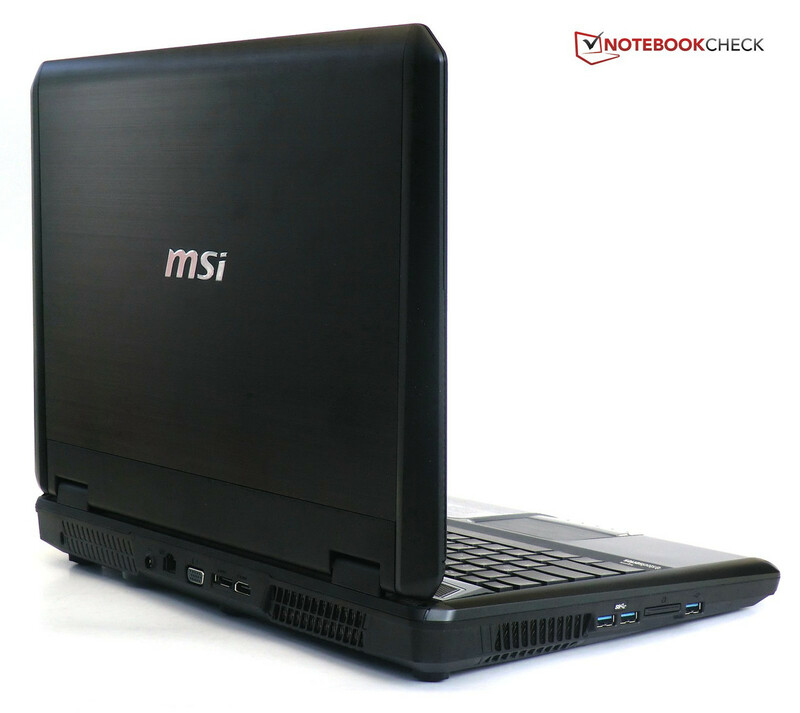 MSI introduces the GT60-i789W7H, a 15 inch notebook focusing on the high-performance gaming sector of the market. 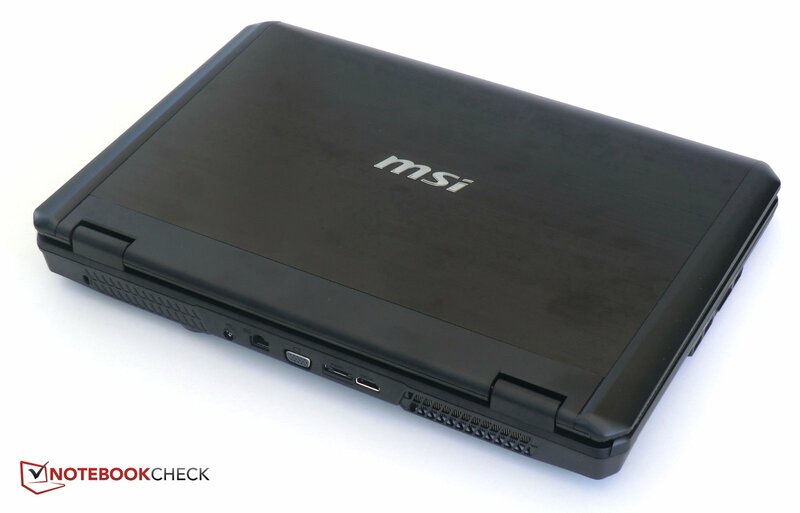 To power this notebook, MSI pairs the 3rd generation Ivy Bridge quad-core Intel Core i7-3610QM CPU with Nvidia’s GeForce GTX 670M, a graphics card that is firmly placed in the highest tier of performance amongst Nvidia cards at press time. 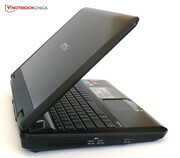 Other components include a 750 GB HDD and 8 GB RAM. With this notebook, MSI also introduces automated overclocking of the graphics card that can be turned on and off at the press of a button, a feature that MSI claims may prove a crucial advantage in games. At a price of about 1400 Euro ($1750 USD), the MSI is not cheap but is reasonably priced given its equipment. Clearly MSI is relying on the GT60’s combination of power and features to target buyers seeking a high-performance gaming laptop. 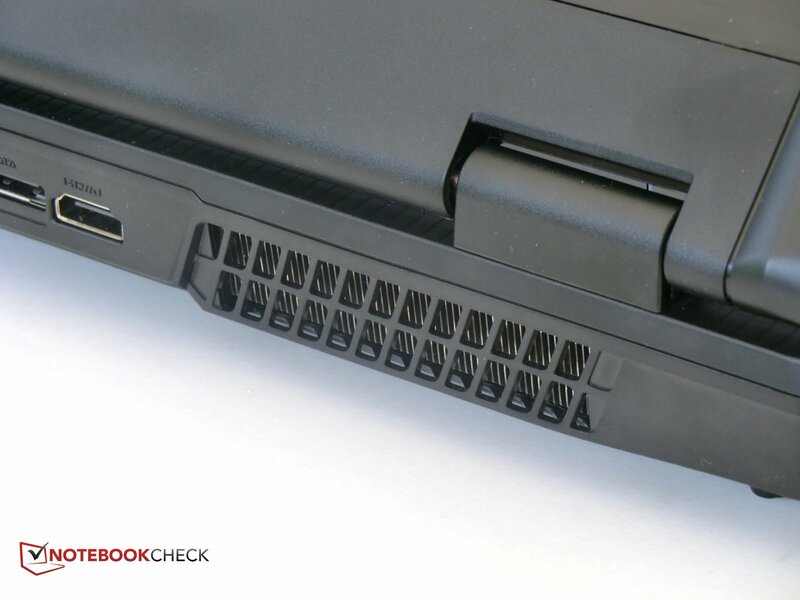 We have already tested the same configuration in the 17-inch-notebook of the series, the GT70, which had problems with heat emissions and throttling. Will the 15 inch version also suffer from the same weaknesses? Will this implementation prove superior to similar packages from other high-end manufacturers? Read more about our analysis and ultimate verdict below. As is to be expected in a gaming notebook, the GT60 features a lavishly elaborate design. 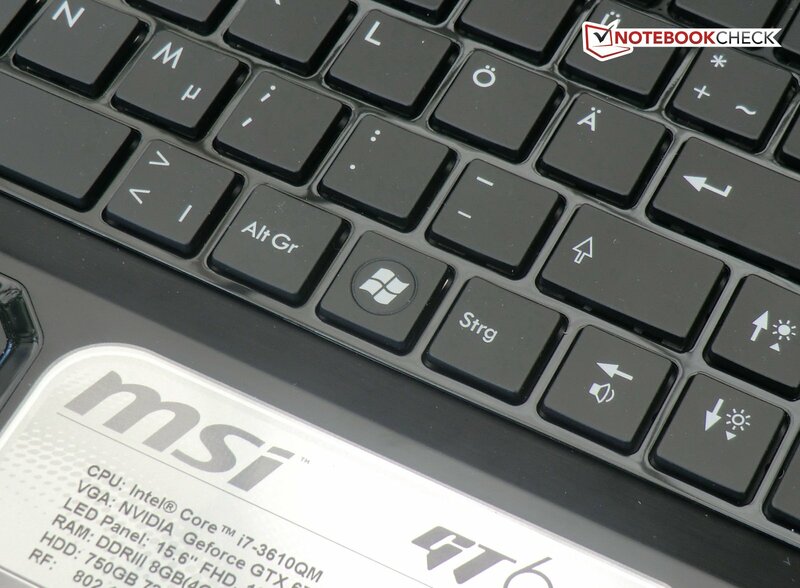 Compared to its predecessor, the MSI GT660R, the top cover of the base unit has been significantly redesigned. Featuring both rounded and hard edges, the overall design of the chassis is often a juxtaposition of both soft and hard. Caught between the extremes are the cut-off-corners of the entire case which are mirrored in the touchpad and display bezels. For a stylish touch, the bezels are made out of high-gloss plastic. In contrast to so much flash, the choice of colors is something straight out of Henry Ford’s handbook. The entire chassis is black. The overall black scheme is offset by the MSI logo, the touchpad buttons, power button, and the speakers which are all clad in chrome. While the majority of the case is uniformly black, the visual impression is hardly monotone. The display is framed in brushed metal and surrounded on both sides by smooth matte plastic. Considering the high-gloss bezel mentioned earlier, the display casing definitely catches one’s eye with the combination of highly-reflective, non-reflective, and semi-reflective surfaces. The display hinges are covered with a textured metallic surface. The brushed metal wrist-rest is surprisingly vulnerable to dirt and finger prints. 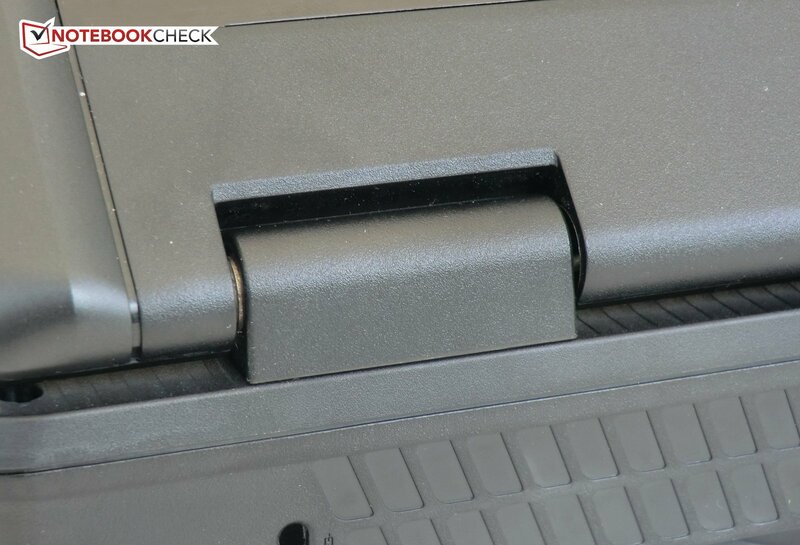 The ledge that separates the keyboard and display follows the machine’s elaborate overall design. 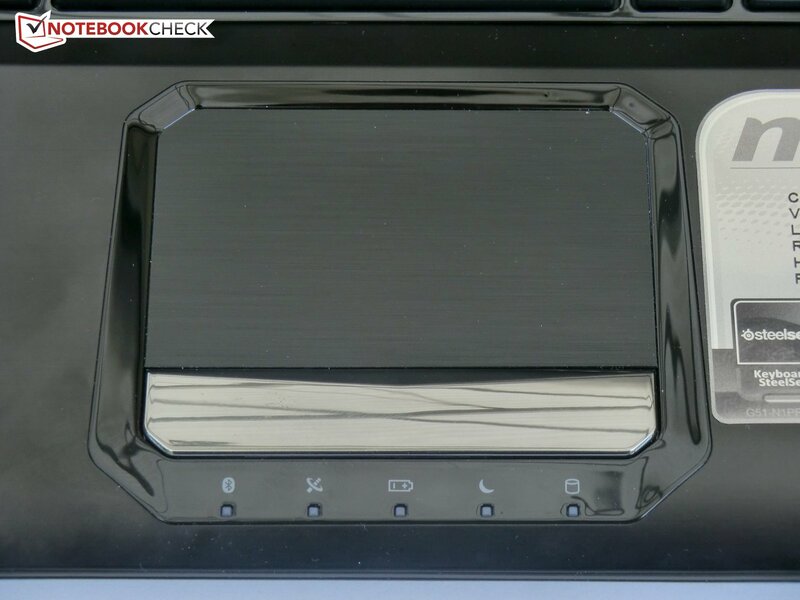 Inset into the ledge is a high-gloss touch-sensitive control console similar to those found on modern LCD displays. In the middle of the console is a chrome-clad power button shaped to resemble a shield crest or superhero’s logo. The chassis has a thickness of 6.0 centimeters (2.3 inches) and weighs a hefty 3.5 kilograms (7.7 pounds). These are unusually high numbers for a 15 inch notebook but are offset by the high stability afforded to the entire system as a result of this design. The case leaves little room for criticism with the lone complaint being that the display lid between the hinges yields a little. This criticism is fairly minor as the hinges still securely hold the display in the desired position. The GT60 features all important ports and interfaces. 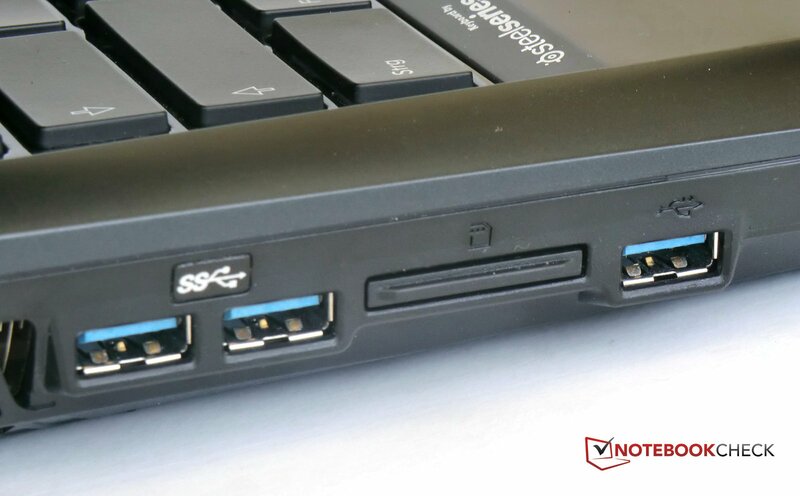 The left side hosts two of the faster, more modern USB 3.0 ports. In front of these ports are a card reader with support for SD, MMC, MS (Pro), and xD cards followed by a standard USB 2.0 port. 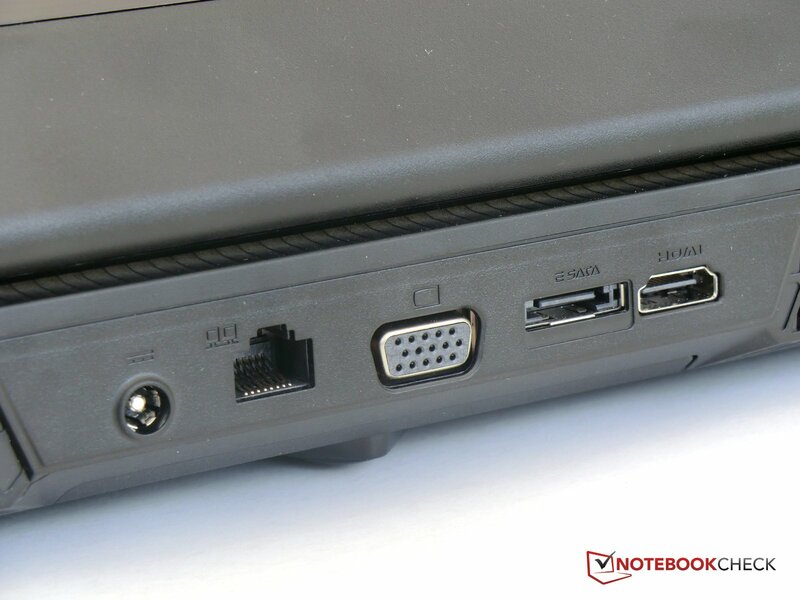 The rear edge of the notebook houses a full sized HDMI port, an eSATA port for external hard drive connectivity, a standard VGA/D-Sub port, RJ-45 LAN port, and power port for the power supply. The right side of the GT60 hosts another standard USB 2.0 port and four gold-plated audio jacks that support 7.1 surround sound audio. The first of these jacks serves as the typical headphone/speaker output jack for 2-speaker or 2.1-speaker use or as S/PDIF output for connection to an external receiver. The second jack functions as output for center or bass channels, or as a microphone input. The remaining two ports are used for connecting the surround channels in 5.1 and 7.1 speaker arrangements. Users choosing to employ all four jacks for 7.1 audio and use an external wired mouse may find the use of cable ties or other cable management system helpful to avoid the mouse from becoming entangled with the speaker cables. 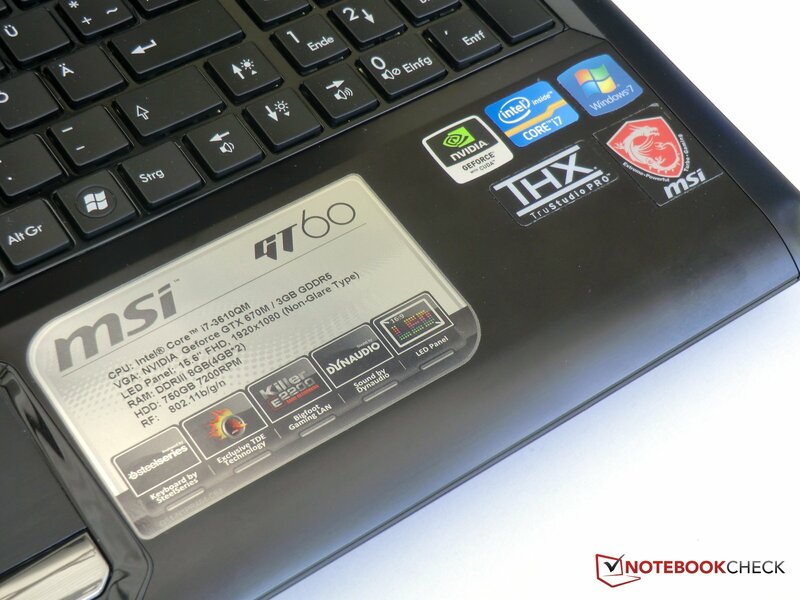 The MSI GT60 features all current network technologies. WiFi is offered using the 802.11b/g/n protocols and Bluetooth 4.0 is included onboard. MSI promotes its LAN solution, an Atheros-based network card with the designation “Killer E2200”. Through the use of optimized software, the Killer E2200 claims to provide a lower latency advantage in online gaming. The notebook comes with a large amount of pre-installed trial software. The notebook also comes with Microsoft Office Starter - stripped-down versions of Excel and Word – pre-installed. MSI also includes the S-Bar program which allows the user to access the Fn-keys via mouse and also allows one to link Windows’ built-in accessory programs to the desktop. The only removable component in the GT60 is the battery. The license and serial number decals are located under it. Opening of the maintenance cover is prohibited by a seal and breaking the seal will void the warranty. The notebook comes with a 24 months and can be extended to 36 months for 140 Euro ($175 USD). The GT60 features a slightly unusual keyboard layout. The Windows key was repositioned between the right Alt Gr and Ctrl keys. MSI claims that this change was made to eliminate gaming interruptions due to accidentally hitting the Windows key. While users will likely become accustomed to this change in short order, the change to the number pad will likely take longer to get used to. The number pad’s 0/Ins key was halved in width in order to accommodate the Right Arrow key. 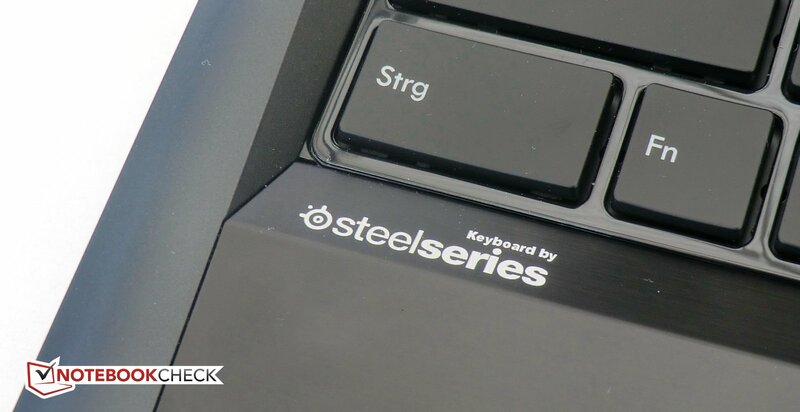 The notebook’s keyboard was designed by SteelSeries, an equipment manufacturer that focuses on gaming controllers such as mice and keyboards. In our keyboard test, we observed little lifting, a hard keystroke, and a clear pressure point, traits that make the keyboard well-suited for gaming. The keyboard can easily detect simultaneous key presses. 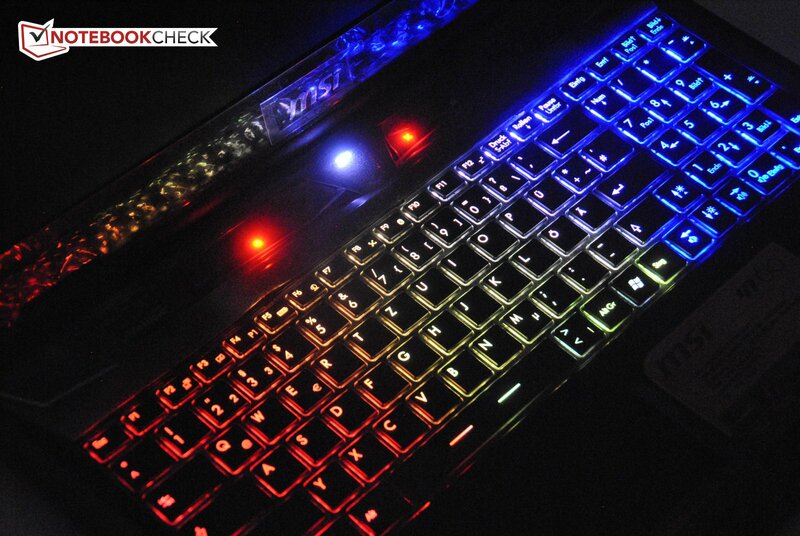 The GT60’s keyboard not only has backlighting but also has individually configurable keyboard-illumination zones . For this feature, the keyboard is divided into three areas that can be illuminated in red, orange, yellow, green, light blue, dark blue, and purple. Some examples of illumination patterns include a continuously moving light cycle and a color gradient that gets brighter or darker smoothly. On either side of the power button are the touch-sensitive keys. These are used to turn on and off the automated overclocking of the graphics card, the huge fan, background illumination, WLAN, and the display. The drive can also be opened using these touch keys. Sadly, the keys of our test sample did not work flawlessly and did not react every time when pressed. It seems like our testing sample has a defective touchpad. The cursor jumps up and down wildly despite the touchpad being untouched.. If the touchpad is turned off and an external mouse is used, everything works normally. We will attempt to obtain a new testing sample in order to determine if this is a design flaw or a unique defect. We will also try to review the touchpad in detail, assuming we receive a new sample with a working touchpad. The GT60 features an LG 15.6 inch anti-glare display with a native Full HD resolution of 1920x1080. In our tests, all measurements were found to be toward the upper end of the middle tier rather than in the highest tier. The maximum brightness of 284 cd/m² and corner brightness of 258 cd/m² are both consistent with devices in the higher-middle tier. These brightness ratings should prove satisfactory for most environments. With an 85% rating, the brightness distribution is fairly good. 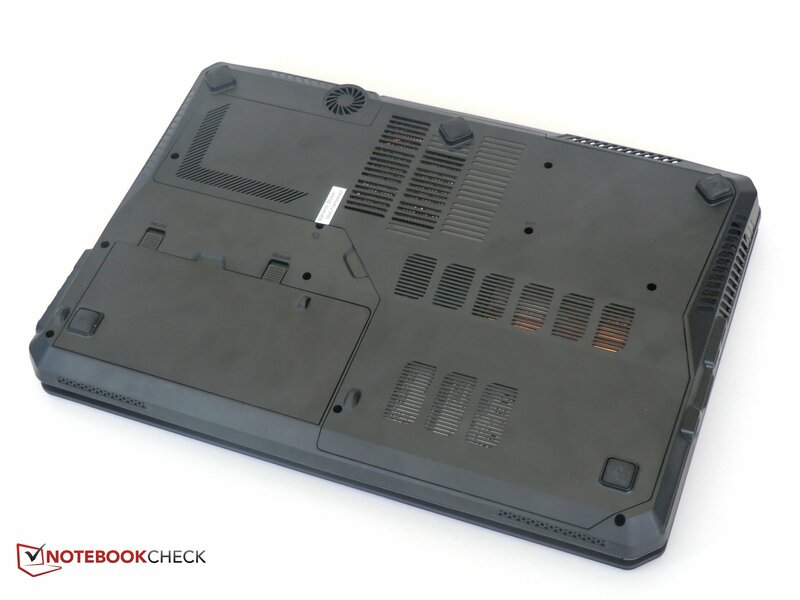 The black level of 0.79 cd/m² is decent for a gaming notebook as is the measured 359:1 contrast ratio. By comparison, the slightly pricier Alienware M14x R2 managed a much higher contrast of 623:1. 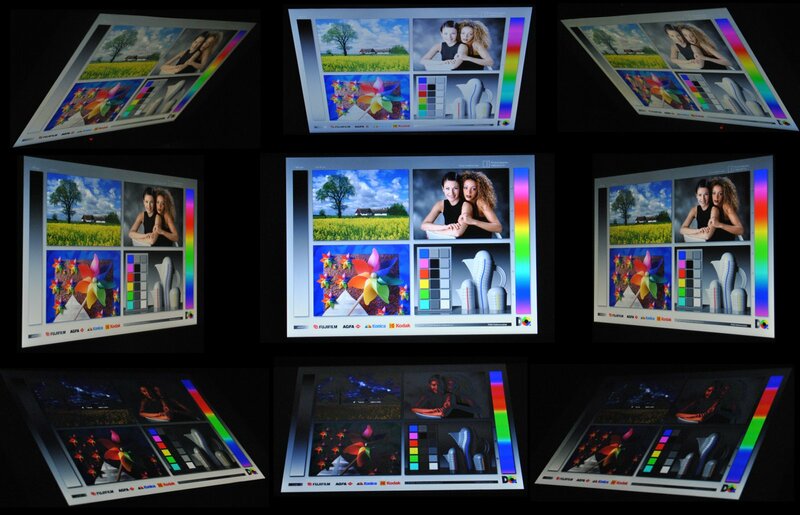 The display has an above average color space coverage and can more or less fully display sRGB. 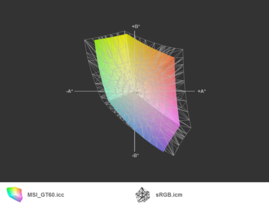 On the other hand, the display does not begin to approach the AdobeRGB color space. That said, professional graphic designers will likely choose other devices and gamers usually do not need this color space. The matte display proves to be excellent in outdoor use. No bothersome reflections were observed in outdoor lighting. Direct sun on the display can make the display’s contents less visible depending on the angle of the sun. A higher brightness would have improved visibility of the display’s contents in this scenario. While likely most users will not heavily use the unit outdoors, the anti-glare surface nonetheless benefits anyone who chooses to participate in longer gaming sessions outdoors. The viewing angles are acceptable but unremarkable. When viewed from side angles, the display maintains color accuracy and the brightness suffers slightly. When viewed above the display’s center line, content is still recognizable but the brightness drops off significantly with increasing angle. When viewed below the display’s center line, the colors invert quickly and brightness drops below a viewable threshold quickly and renders the display unusable from negative viewing angles. The GT60 features the Intel Core i7-3610QM, a third generation quad-core Ivy Bridge CPU. This processor has plenty of power to edit video, perform computer aided design (CAD), and play games. All challenging tasks are within reach with this processor. 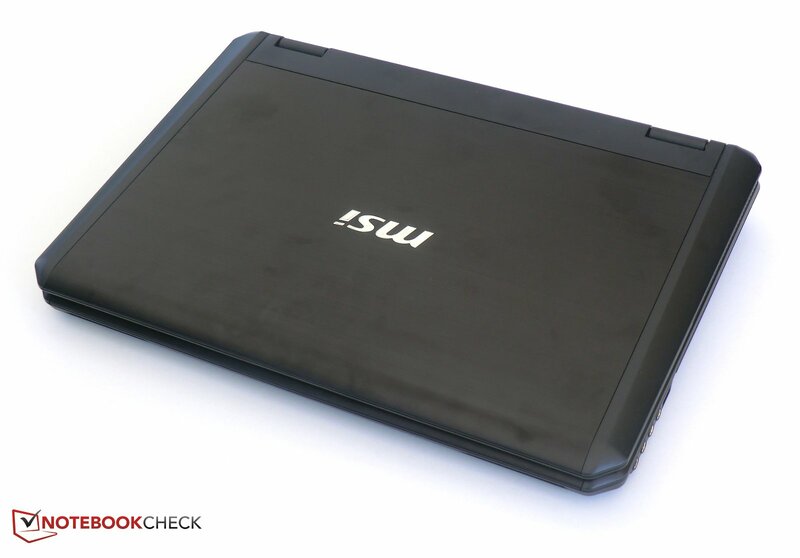 The i7-3610QM also boasts an updated integrated graphics card. The Intel HD Graphics 4000 serves as the successor to the Intel HD Graphics 3000 and offers roughly 40% more power than its predecessor. While capable of running many tasks, it goes without saying that the HD Graphics 4000 is not designed to drive modern 3D games. 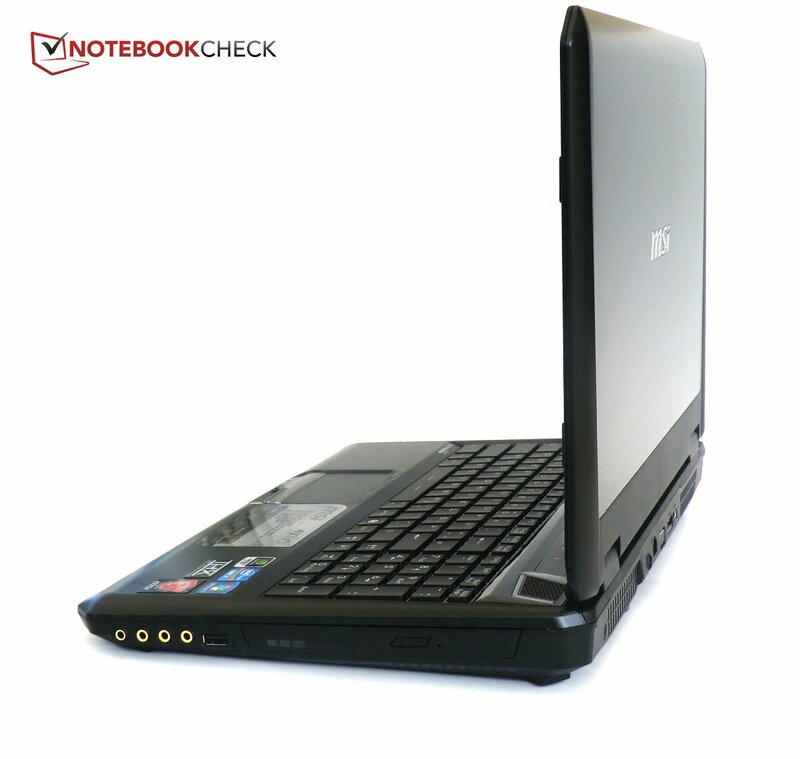 For this purpose, the notebook employs Nvidia’s Optimus technology to switch between the HD Graphics 4000 and the dedicated graphics card, the Nvidia GeForce GTX 670M, on-the-fly. The Nvidias GeForce GTX 670M is an upper-class graphics card that uses the previous generation Fermi architecture. While the 670M provides sufficient power for playing current games at high settings, the GPU uses 75 Watts TDP for these tasks. 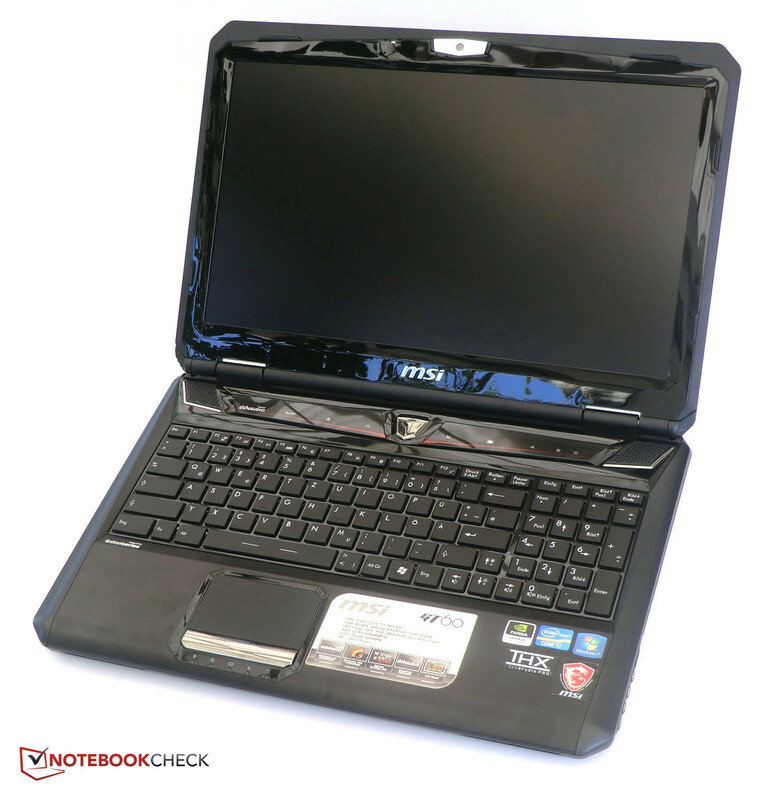 In certain European markets, two variants of the notebook are available featuring different drives and RAM. 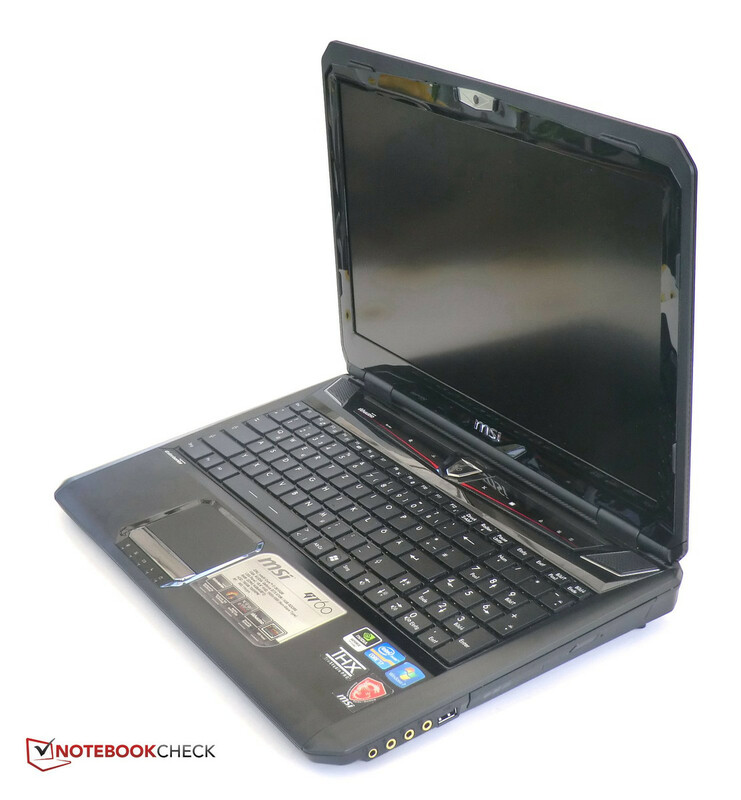 Our test sample, the GT60-i789W7H, came equipped with two 4 GB DDR3 RAM modules for a total memory size of 8 GB, a DVD writer, and a 7200 RPM 750 GB HDD. 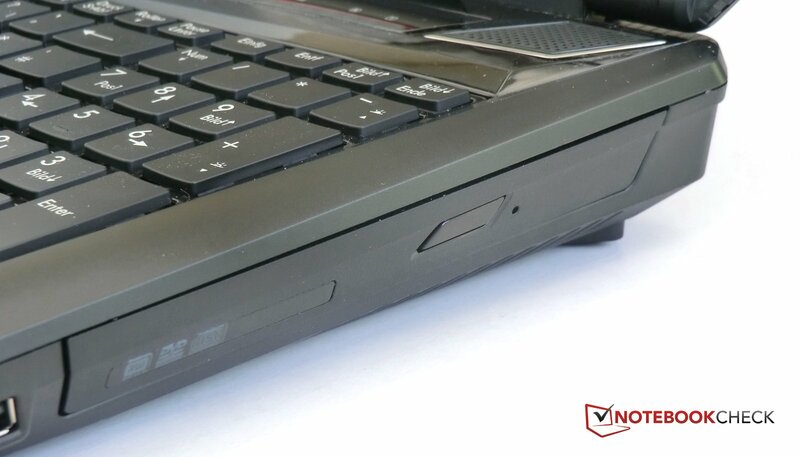 The alternative GT60PH-i7169BWW7H is much better equipped, featuring 16 GB RAM and a BluRay writer. As well, the i7169BWW7H variant provides an additional 128 GB RAID 0 (striping) array using 2 mSATA SSDs and boasts transfer speeds up to 800 MB/s. In the GT60’s implementation, the CPU does not become bottlenecked or throttled. An efficient cooling system allows the CPU to achieve the highest score in the Cinebench R10 32-bit Multiple CPU benchmark amongst i7-3610QM processors with a score of 17,464 points, beating the 17-inch-variant of the series which scored 17,132 points. Its score places it firmly between the Core i7 2920XM and Core i7 2960XM. The battery provides enough power to allow the processor to perform at full speed when running off AC power. We used PCMark to determine overall system performance. In PCMark 7, our test sample met our expectations with a score of 2875 points, placing it slightly above the Samsung 550P7C which uses the same CPU and HDD but a weaker graphics card. The 17 inch variant, with the same processor and GPU, but with a RAID 0 SSD achieves a score of 4204, nearly 50% better. 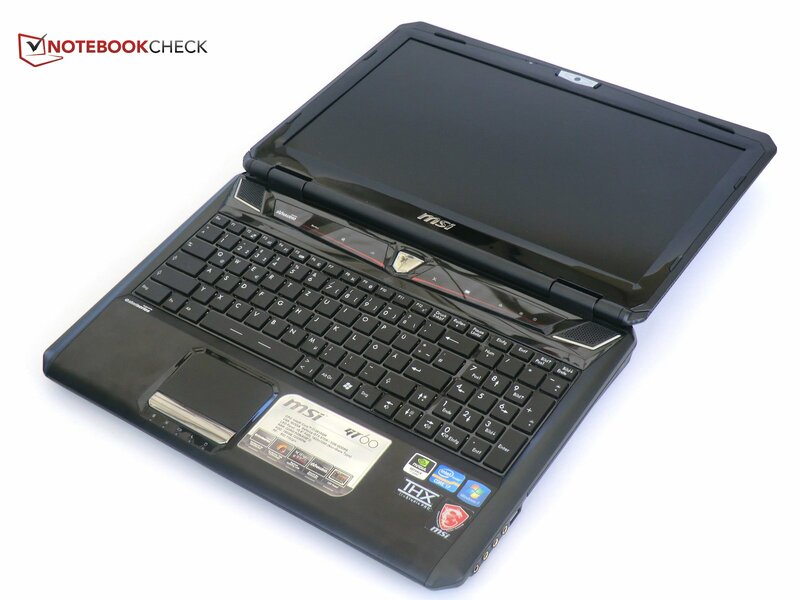 The Hitachi 7K750 7200 RPM 750 GB serves as the notebook’s storage device. The 7200 RPM rotational speed of this drive provides an advantage compared to slower 5400 RPM drives – higher data transfer rates. However, this advantage comes at the expense of more noise emission and more power consumption. While not on the level of SSDs, the Hitachi 7K750 with its transfer rate of 98 MB/s is much faster than most mechanical hard drives and comes very close to the performance of the older Samsung SSD 800 whose transfer rate was measured to be 101 MB/s. The access times however remain considerably behind those of any SSD. 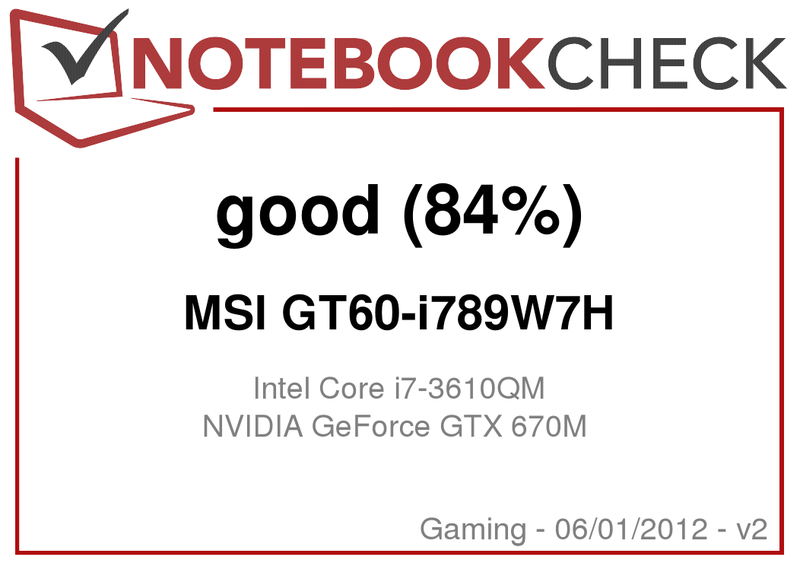 For comparison, MSI’s RAID 0 SSD configuration was tested in the review of the 17 inch GT70. Readers potentially interested in the performance of the GT60PH-i7169BWW7H should consider the GT70’s storage performance as a baseline. With Optimus technology, the GT60 can switch between its two graphic solutions in real time. 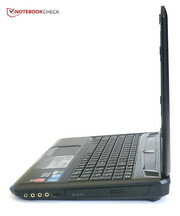 For simple work tasks such as surfing the internet, the integrated Intel HD Graphics 4000 offers more than enough power. For 3D games and applications the GeForce GTX 670M takes over. The automated switching between the two GPUs is typically done flawlessly and seamlessly. In our test sample, we had to force the use of the GTX 670M in Nvidia’s settings when trying to play Risen 2 and DiRT. 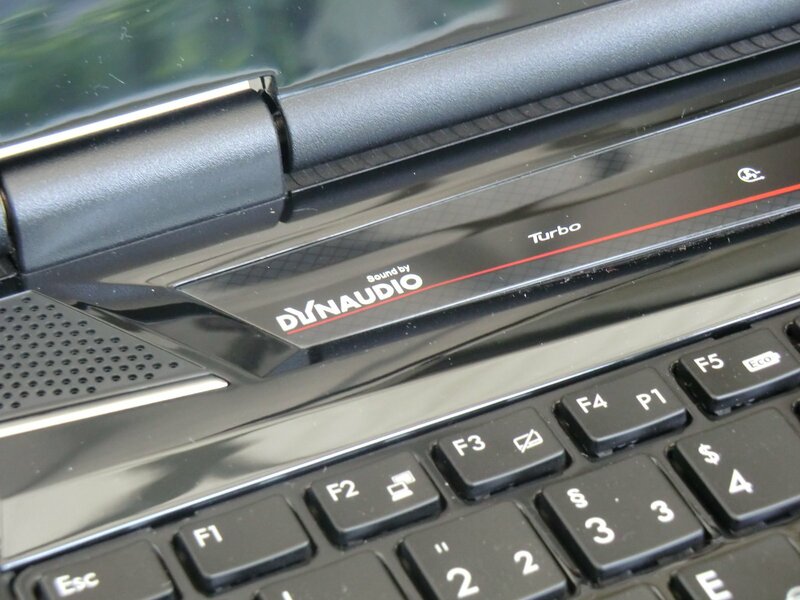 In the GT60, MSI added an on-demand graphics overclock button next to the left speaker. This button overclocks the GPU from 595 MHz to a constant 620 MHz. As a result, the GT60 achieves the highest score of 3114 in 3DMark 11 amongst notebooks with the same GPU. Non-overclocked GTX 670M GPUs do not exceed 3000 points in 3DMark 11 and as a result are limited to 96% of the graphical power of the GT60. It should be noted that overclocking is only possible if the notebook is connected to the power supply. When using the battery, the GPU de-clocks to 75 MHz, making the GTX slower than even the integrated Intel HD Graphics 4000 despite consuming more power. This makes playing games while under battery power impractical and highly limited. With our sample configuration, all current games could be played in high or even very high settings. We tested three recent games – Risen 2, Diablo III and DiRT Showdown – along with F1 2011. We were able to play Diablo III at the highest settings. We measured an average of 60 frames per second (fps) with the lowest observed frame rate being 53 fps. The notebook was able to maintain a stutter-free experience. In order to maintain fluidity, DiRT Showdown had to have its settings reduced slightly. Maximum settings reach the hardware’s limits and we observed an average of 29 fps with the frame rate dropping to 25 fps at times. Using high settings, the game performed admirably with an observed average frame rate of 73 fps. The most demanding game in our test was Risen 2: Dark Waters. At maximum settings, the game clearly stutters. Using high settings, the game plays smoothly at 49 fps, sometimes dropping to a still-fluid 40 fps. 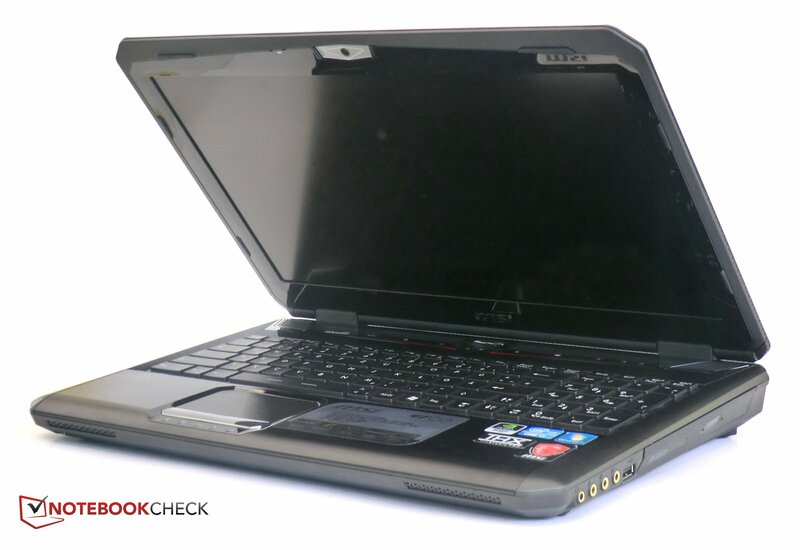 The older F1 2011 is well suited for use as a comparison with other notebooks featuring the GTX 670M. In this game, the GT60 maintained a frame rate lead over the larger GT70 despite being a little warmer. On the other hand, the GT60 falls short of the performance of other GTX 670M-based notebooks such as the Asus G75V, which admittedly has a better CPU in the i7 3720QM. Numerous benchmarks of other games tested on this hardware platform can be found in the review of the 17 inch GT70. While idle, the GT60 produced an audible but acceptable noise level of 36 dB. While watching a movie, the DVD drive could potentially distract viewers during quiet scenes with its 37 dB observed noise emission. Under load, the notebook became considerably noisier. With automated overclocking of the GPU turned off and with the fan set to the lowest setting, the notebook was a rather loud 44 dB. When overclocking was activated, the system became noisy at 51 dB. 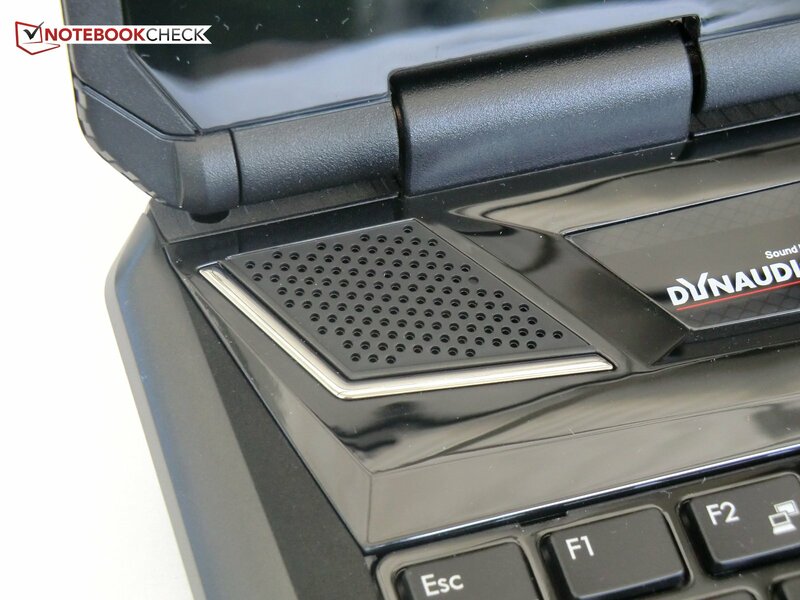 The additional activation of the user-adjustable fan using the Cooler Boost key and forcing it to run at maximum speed caused the notebook to generate a very loud and annoying 53 db of noise. The GT60 manages its heat control respectably. At idle, the notebook’s temperatures remained at an acceptable level with a maximum of 27°C (81°F). Under load, the wrist rest stayed comfortably cool at 24°C (75°F). The rear end of the unit reached higher temperatures. The fan ventilation slits reached temperatures upward of 50°C (122°F), making a heat-proof base a requirement while gaming. (+) The average temperature for the upper side under maximal load is 27 °C / 81 F, compared to the average of 32.9 °C / 91 F for the devices in the class Gaming. We conducted a stress test on the system by running both Prime95 to stress the CPU and FurMark to stress the GPU. Both components were left at full load for an hour to determine whether the system’s cooling solution was adequate to maintain full power operation or whether the system is throttled to reduce temperatures. As was the case with the larger GT70, the GT60 has problems with throttling. The CPU does not undergo a steady de-clocking but rather fluctuates between 1.2 GHz and the maximum Turbo Boosted speed of 3.1 GHz. This represents a range of 1.1 GHz below the standard clock speed and 0.8 GHz above it. However, in real world gaming throttling was not an issue. 3DMark 6 delivered the same performance as before and the Risen 2 could be played with a constant clock speed of 3.1 GHz. The system features speakers designed by Danish high-fidelity audio producer Dynaudio. As one might expect, the sound quality is relatively good. 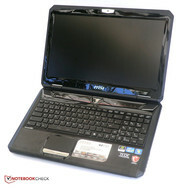 While the bass could be more distinct and the sound was dull when the software-based crystallizer was turned off, the speakers are appropriate for a gaming notebook. Depending on use, the power consumption varies significantly. 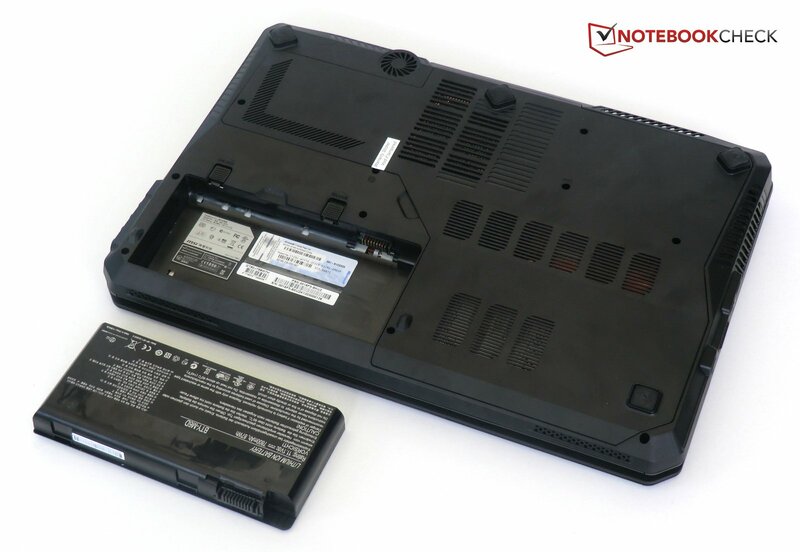 At its most efficient, the notebook had a very low consumption of 15 Watts. To achieve this low power consumption, the screen was set on lowest brightness and the wireless network adapter was deactivated. The energy-saving measures of the CPU and the deactivation of Nvidia’s GPU also contributed to this low consumption profile. In a moderate usage scenario, the Nvidia GPU was activated and the system was placed under load via 3DMark 06. The power consumption increased to 110 Watts for this situation. To observe maximum power consumption, we also overclocked the GPU and maximized the fan speed. This resulted in a power consumption of 160 Watts. Our conclusion from these tests is that the 180 Watt power supply should be able to provide sufficient power at all times. 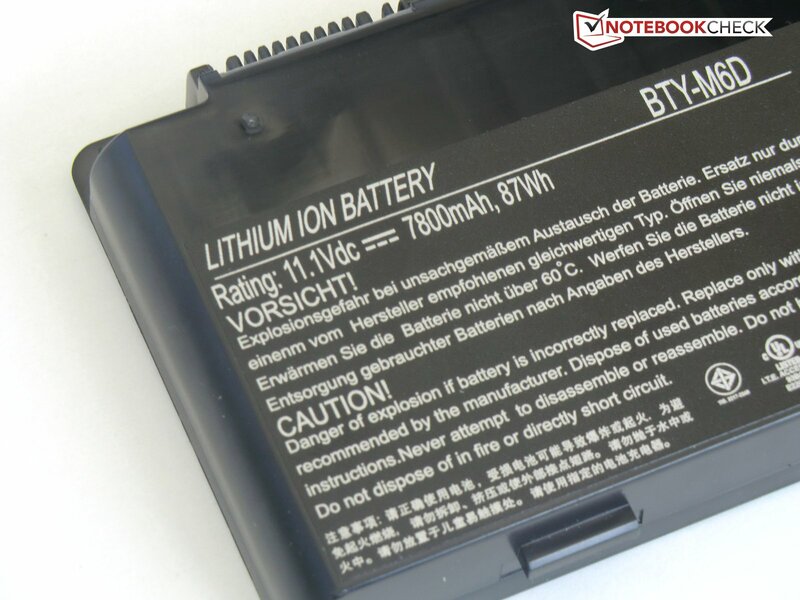 For the battery, MSI chose a Lithium-Ion (Li-Ion) battery with a rated capacity of 87 Wh. As shown above, the power consumption can vary greatly based on various profiles and settings. To test the effects of the dramatically different power consumption, we constructed four scenarios which are described below. It should be noted that the aforementioned GPU throttling significantly increases the battery runtimes in all tests. Using Battery Eater Readers Test, we simulated the reading of a text document. During this test, the display was set to its lowest brightness and wireless was turned off. Additionally, all available power-saving options were used. In this test, we measured a runtime of about 6 hours. We then used the more realistic and more relevant WLAN Test. The display’s brightness was set to approximately 150 cd/m², the energy-saver profile was selected, and the wireless radio was turned on. We then proceeded to surf the internet. Under these settings, the notebook demonstrated a runtime of 4.5 hours. In the third test, we were able to watch a full movie played through the DVD-drive. Our observed runtime of over 3 hours exceeds the duration of all but a few movies. Full-featured extended cut versions of movies may require a full battery charge before watching. Under load and with the brightest display settings, we again tested battery runtime with Battery Eater Classic. In this test, we observed a runtime of 1.5 hours. This runtime is made possible by a strong throttling of the GPU while the processor delivers the same power as it would if the notebook were connected to the power supply. First impressions count. This is why MSI paid special attention toward the design. With this in mind, MSI has developed something extraordinary in the GT60 whose cut-corners and combination of glossy and matte materials helps it stand out in a crowded high-performance market. With its 6 centimeter (2.4 inch) thickness, the notebook is thick but this thickness lends itself to very good stability. 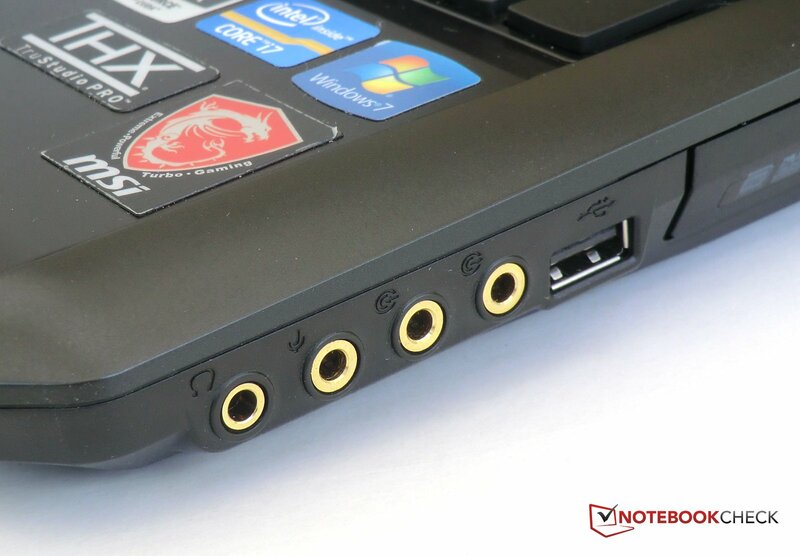 The notebook features all important interfaces and special notice should be given to the integrated 7.1 sound card that can drive external speakers via the audio jacks or digitally connect to an external receiver via S/PDIF. Naturally, 802.11b/g/n WiFi, Bluetooth 4.0, and gigabit LAN are included. The keyboard is particularly eye-catching. It can be illuminated in various colors. The appearance also mirrors its feel. The keyboard feels pleasant while typing and special attention was given to the notebook’s intended role as a gaming machine in the layout of the keyboard. The matte Full HD display provides a reflection-free visual interface. The brightness is sufficient and well spread, but black level could be better and the contrast is subsequently below expectation. The viewing angles are acceptable and should suffice for home use. The GT60 comes equipped with an up-to-date Intel Ivy Bridge Core i7-3610QM processor and the Nvidia GeForce GTX 670M dedicated graphics card. Both score good benchmark results and offer enough horsepower for nearly all applications. For more casual applications, the integrated Intel HD Graphics 4000 can be used. It should be mentioned that the GTX 670M can be overclocked at the press of a button and an additional 4% of performance can be squeezed out of the graphics system. A fast 750 GB hard drive was used as storage device. Combined with 8 GB RAM and the aforementioned components, sufficient power is provided. Most computer games can be played fluidly at high or even maximum settings. The fan can be forced to operate at maximum speed at a button press. The fan is clearly audible at maximum speed but cools the system well. While the fan is clearly audible even with the CPU is idle, temperatures always stay within an acceptable range. Under load, the energy consumption is very high as expected. While idle, the GT60 is able to reduce this amount drastically and reaches runtimes of 4.5 hours while surfing via WiFi. 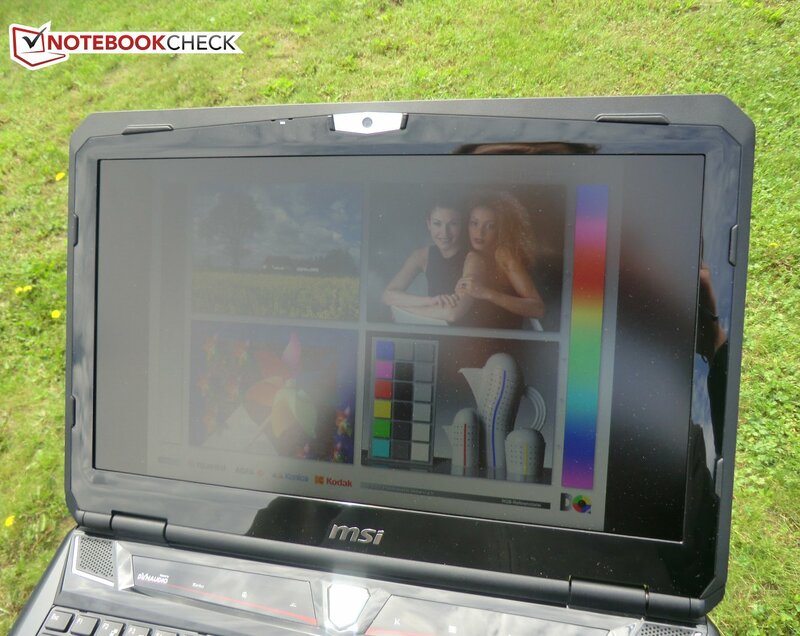 All things considered, MSI offers a solid gaming notebook with many features and only a few weaknesses at a reasonable price of 1400 Euro ($1750 USD). 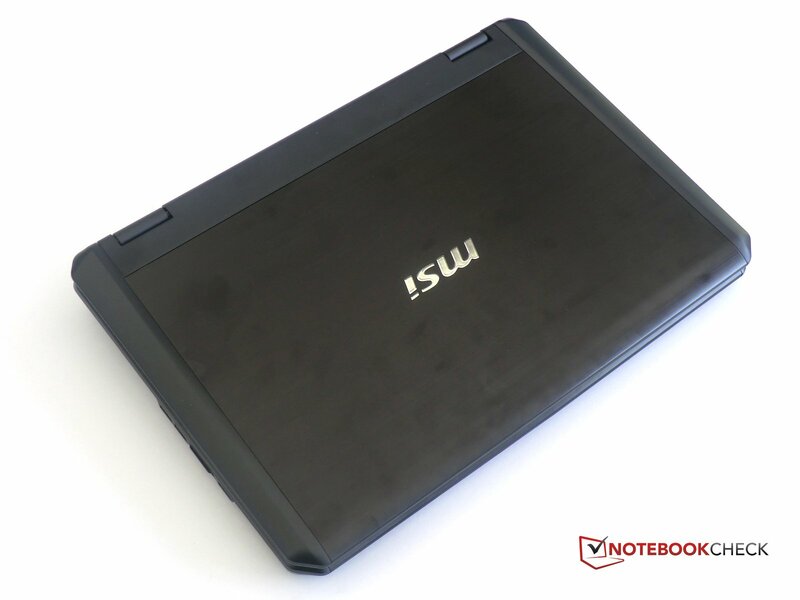 Users searching for performance in a compact package and are able to get used to the GT60’s somewhat unique design may want to add the MSI GT60-i789W7H to their short list. ... the speaker offer an adequate quality. Additionally, a 7.1 Soundcard is built in. In another version, even a BlueRay-drive is included. Most important interfaces are positioned on the back. On the left side: 2 up-to-date USB 3.0 slots. A sticker prohibits the opening of the maintenance hatch. The battery can still be removed. 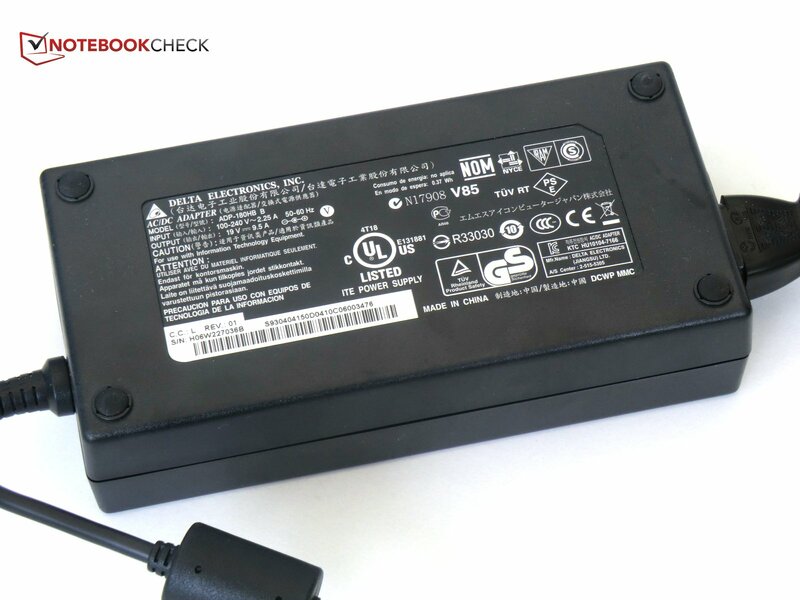 It delivers a capacity of 87 Wh. The power supply is rated at 180W. The keyboard illumination can be set individually. ... a huge and loud fan. ... and a Nvidia GeForce GTX 670M. ... is carried by two heavy hinges. ... is designed very permissive. The matte display and the keyboard illumination. A little more silence, both at rest and under load. The severe throttling of the graphics card while using the integrated battery - resulting in a clock lower than the one of the integrated GPU.